Backgammon originated in ancient Mesopotamia over 5,000 years ago. 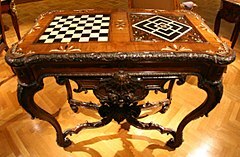 Chess, Pachisi and Chaupar originated in India. Go and Liubo originated in China. Patolli originated in Mesoamerica played by the ancient Aztec and The Royal Game of Ur was found in the Royal Tombs of Ur, dating to Mesopotamia 4,600 years ago. The earliest known games list is the Buddha games list. ^ Piccione, Peter A. (July – August 1980). "In Search of the Meaning of Senet" (PDF). Archaeology: 55–58. Retrieved 14 July 2018. ^ "Okno do svita deskovych her". Hrejsi.cz. 27 April 1998. Archived from the original on 8 December 2012. Retrieved 12 February 2010. ^ Pivotto, Carlos; et al. "Detection of Negotiation Profile and Guidance to more Collaborative Approaches through Negotiation Games" (PDF). Retrieved 2 October 2014. ^ Quotations, K. Kris Hirst K. Kris Hirst is an archaeologist with 30 years of field experience She is the author of The Archaeologist's Book of; Science, her work has appeared in; Archaeology. "What? Snakes and Ladders is 4,000 Years Old?". ThoughtCo. Retrieved 23 December 2018. ^ "A 4,000-Year-Old Bronze Age Game Called 58 Holes Has Been Discovered In Azerbaijan Rock Shelter". WSBuzz.com. 18 November 2018. Retrieved 23 December 2018. ^ Bower, Bruce (17 December 2018). "A Bronze Age game called 58 holes was found chiseled into stone in Azerbaijan". Science News. Retrieved 23 December 2018. ^ Fessenden, Tracy (2007). Culture and Redemption: Religion, the Secular, and American Literature. Princeton University Press. p. 271. ISBN 978-0-691-04963-2. Retrieved 7 February 2009. ^ Hofer, Margaret K. (2003). 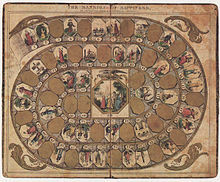 The Games We Played: The Golden Age of Board & Table Games. Princeton Architectural Press. ISBN 978-1-56898-397-4. Retrieved 7 February 2009. ^ Weber, Susan & Susie McGee (n.d.). "History of the Game Monopoly". Archived from the original on 10 February 2009. Retrieved 3 February 2009. ^ Downey, Greg (November 1999). 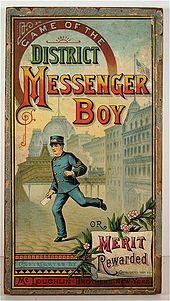 "Information Networks and Urban Spaces: The Case of the Telegraph Messenger Boy". Antenna. Mercurians. Archived from the original on 7 August 2008. Retrieved 7 February 2009. ^ a b c d Duffy, Owen (25 November 2014). "Board games' golden age: sociable, brilliant and driven by the internet". the Guardian. ^ "U3a International Chess by Email". Retrieved 8 October 2014. ^ "Print & Play". Retrieved 8 October 2014. ^ "DVD Board Games". Retrieved 8 October 2014. ^ "Audio Cassette Board Games". Retrieved 8 October 2014. ^ Hall, Charlie (1 December 2016). "Tabletopia is slick as hell, and it's free on Steam". Polygon. Retrieved 7 September 2017. ^ O'Conner, Alice (1 October 2015). "Cosmic Encounter Officially Invades Tabletop Simulator". Rock Paper Shotgun. Retrieved 1 August 2016. ^ Wawro, Alex (3 July 2015). "Mod Mentality: How Tabletop Simulator was made to be broken". Gamasutra. Retrieved 8 July 2015. ^ Freeman, Will (9 December 2012). "Why board games are making a comeback". the Guardian. ^ Scanlon, Jennifer (2001). "Board games". In Browne, Ray Broadus; Browne, Pat (eds.). The Guide to United States Popular Culture. Popular Press. p. 103. ISBN 978-0-87972-821-2. ^ "Pamiętacie Eurobiznes? Oto wielki powrót gier planszowych, dla których oni zarywają noce". Menstream.pl. 16 April 2013. Archived from the original on 5 January 2016. ^ "Monopoly Killer: Perfect German Board Game Redefines Genre". WIRED. 23 March 2009. Archived from the original on 10 May 2015. Retrieved 23 April 2015. ^ Simons, Daniel (15 February 2012). "How experts recall chess positions". The Invisible Gorilla. Retrieved 21 November 2017. 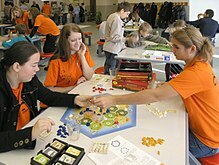 ^ "How Family Game Night Makes Kids Into Better Students". 16 July 2014. Retrieved 23 April 2015. ^ Heron, Michael James; Belford, Pauline Helen; Reid, Hayley; Crabb, Michael (27 April 2018). "Meeple Centred Design: A Heuristic Toolkit for Evaluating the Accessibility of Tabletop Games". The Computer Games Journal. 7 (2): 97–114. doi:10.1007/s40869-018-0057-8. ISSN 2052-773X. ^ Heron, Michael James; Belford, Pauline Helen; Reid, Hayley; Crabb, Michael (21 April 2018). "Eighteen Months of Meeple Like Us: An Exploration into the State of Board Game Accessibility". The Computer Games Journal. 7 (2): 75–95. doi:10.1007/s40869-018-0056-9. ISSN 2052-773X. Diagram Group (1975). Midgley, Ruth (ed.). The Way to Play. Paddington Press Ltd. ISBN 978-0-8467-0060-9.